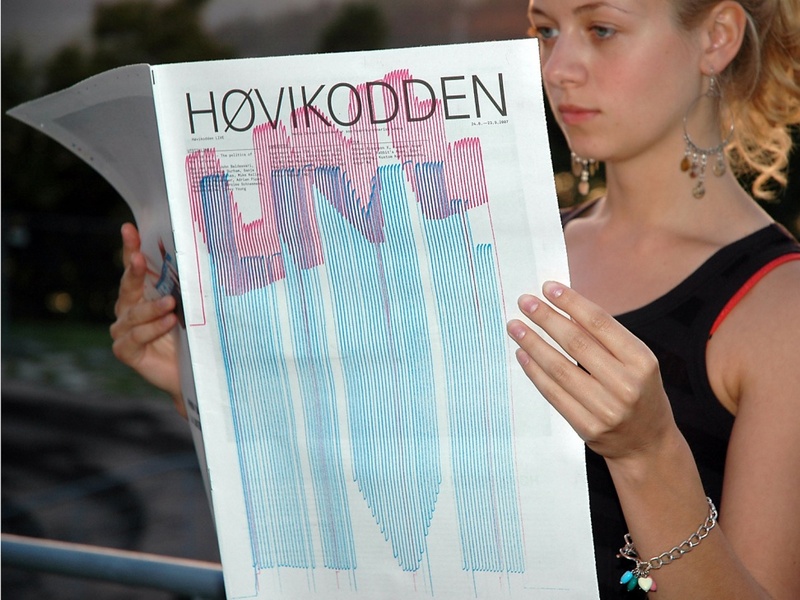 The Henie Onstad Art Centre staged Høvikodden Live for the first time in 2007. 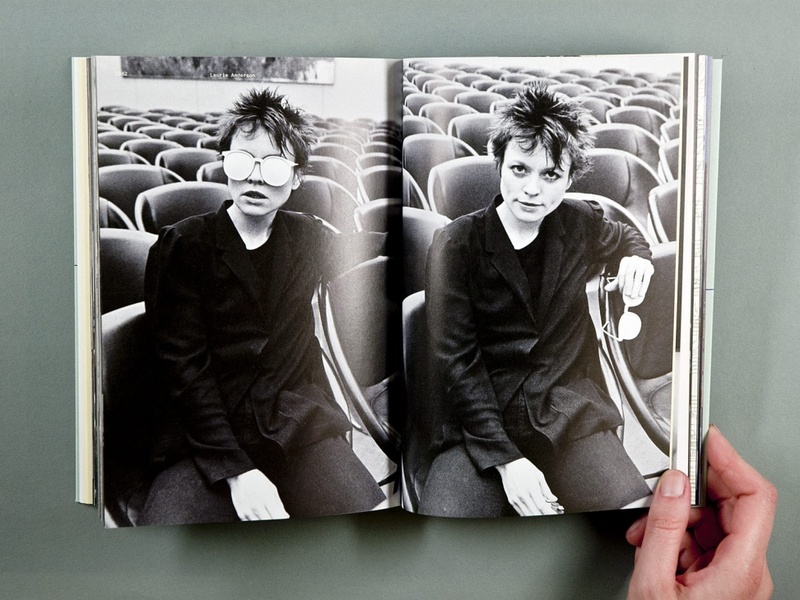 The event consisted of a large-scale international exhibition, a concert series as well as art film screenings. We were asked to design a newspaper, invitations and banners as well as a book. For this project, we collaborated with Daniel Maarleveld, Jaan Evart and Julian Hagen, creators of the PenJet. 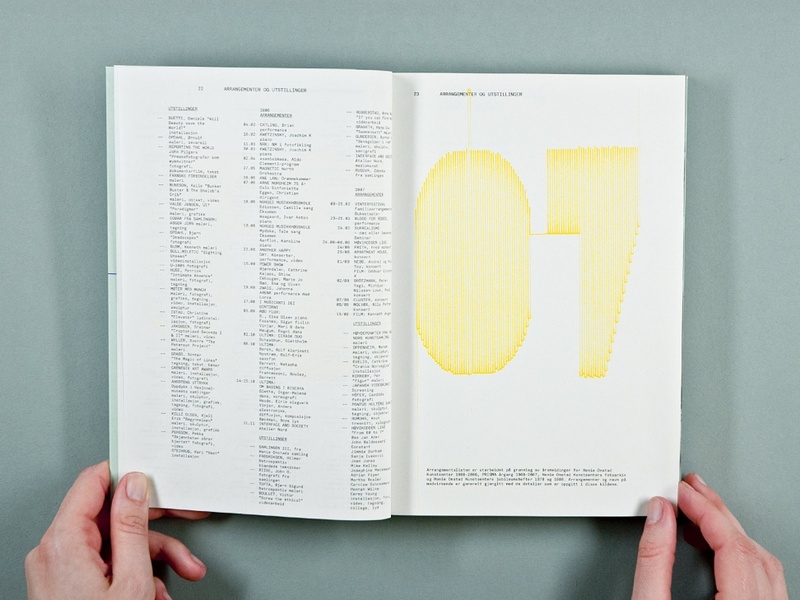 The PenJet is an ordinary inkjet printer, but with a pen attached to its print head. This pen draws the movement of the print head. 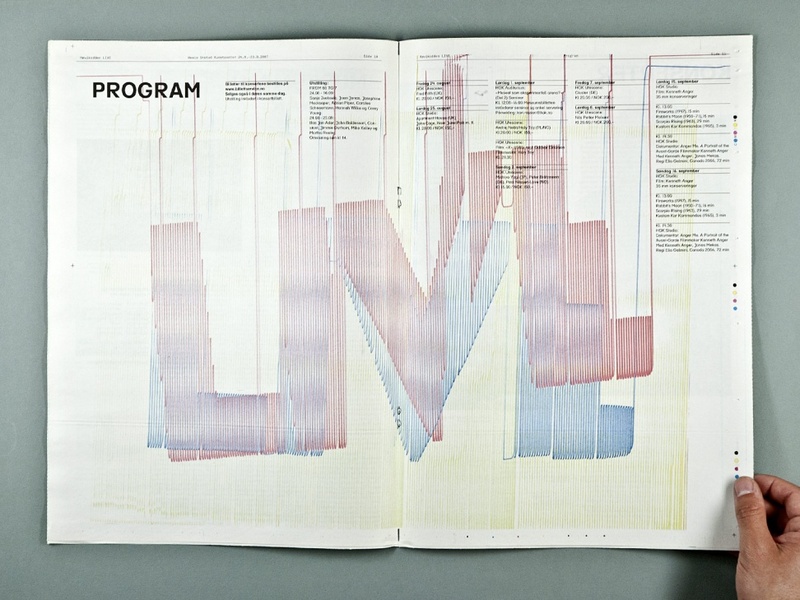 We used the PenJet to write the word ‘LIVE’, making ever-changing variations for the different design elements. 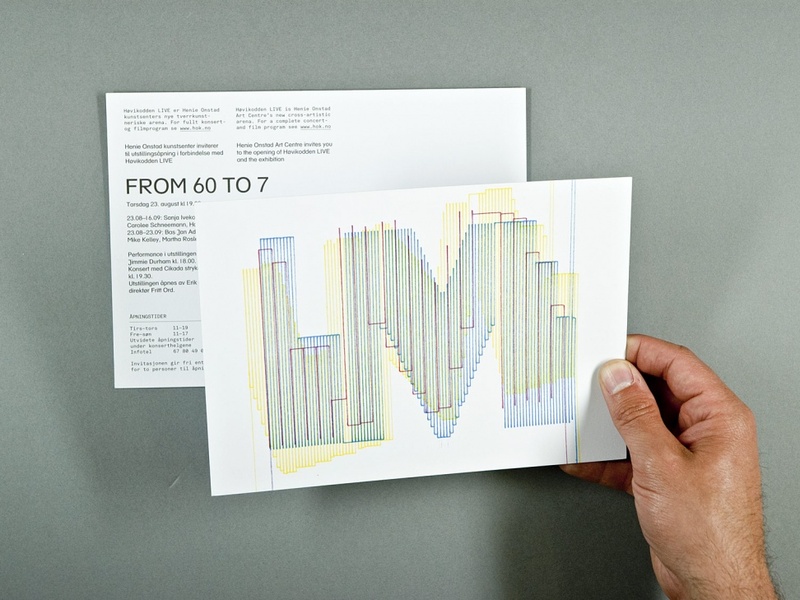 We also had a PenJet running at the opening of the event, again printing unique versions of the word ‘LIVE’. 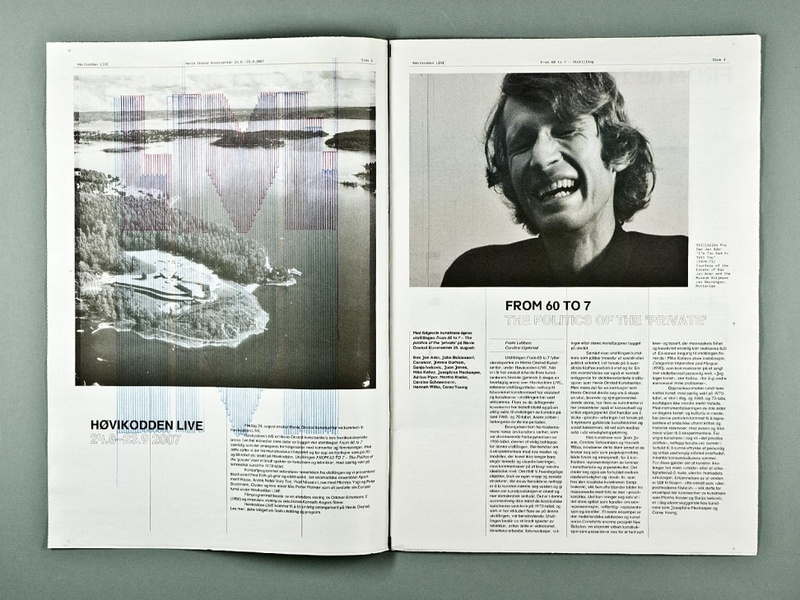 For the newspaper, we played on the fact that newspapers in Norway are usually rather imprecisely printed. 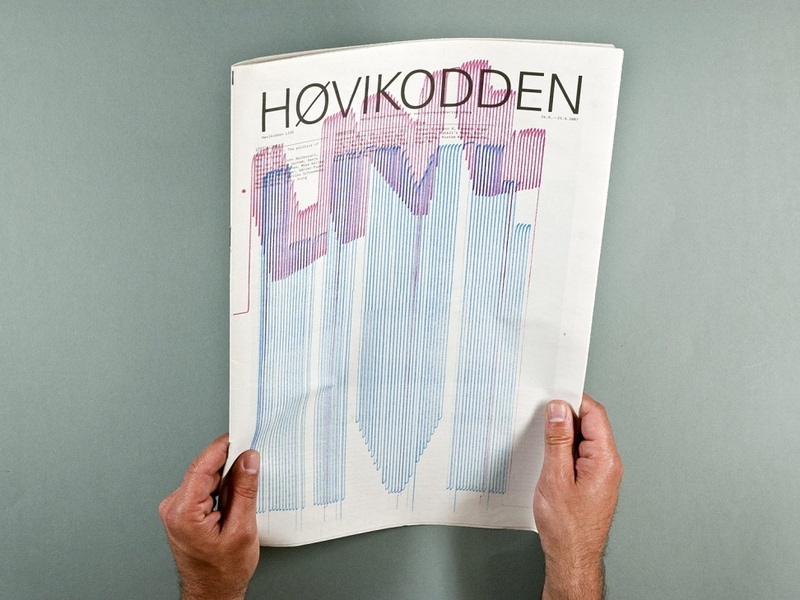 Misalignment, where the CMYK plates are minutely offset from one another, is quite common. We decided to create text and graphics using thin lines in CMY colours, which constantly change according to the degree of misalignment. 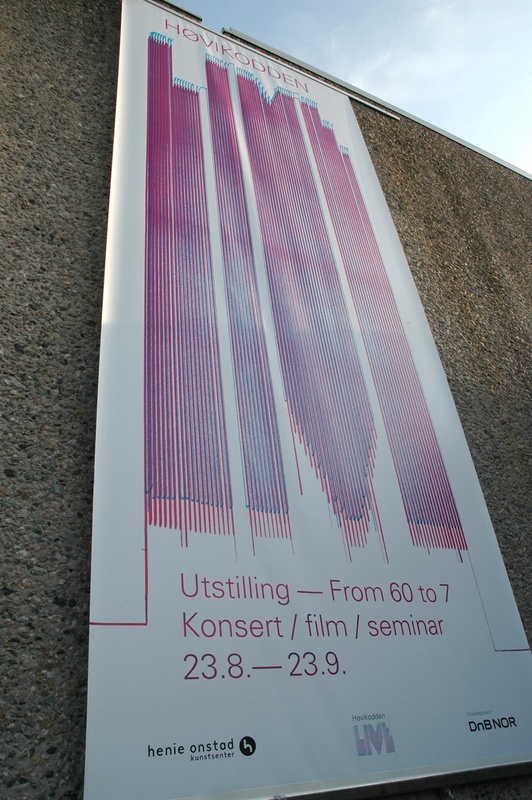 The Henie Onstad Art Centre has a unique history of pioneering cross-artistic activities in Norway, such as performance, dance and music. 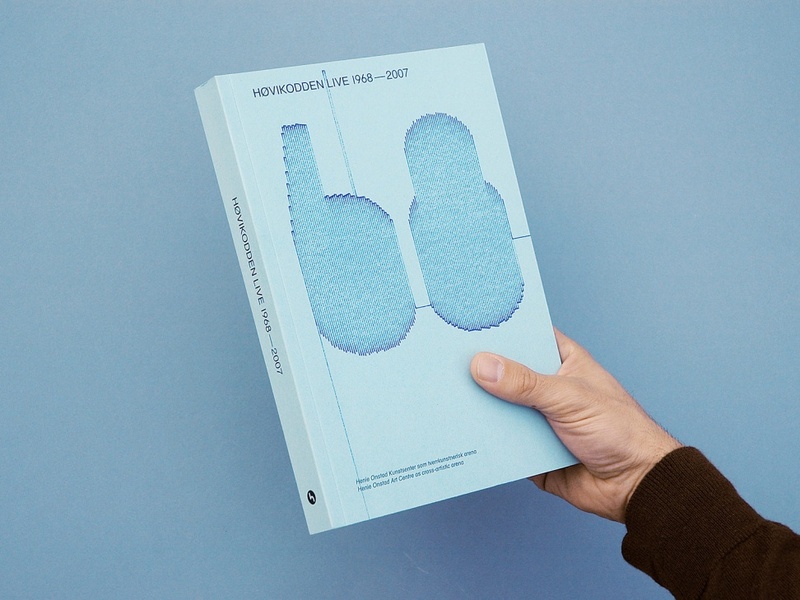 We were asked to design and edit a book about the history of the art centre’s cross-artistic activities from 1968 to the present, in conjunction with the first Høvikodden LIVE event in 2007. 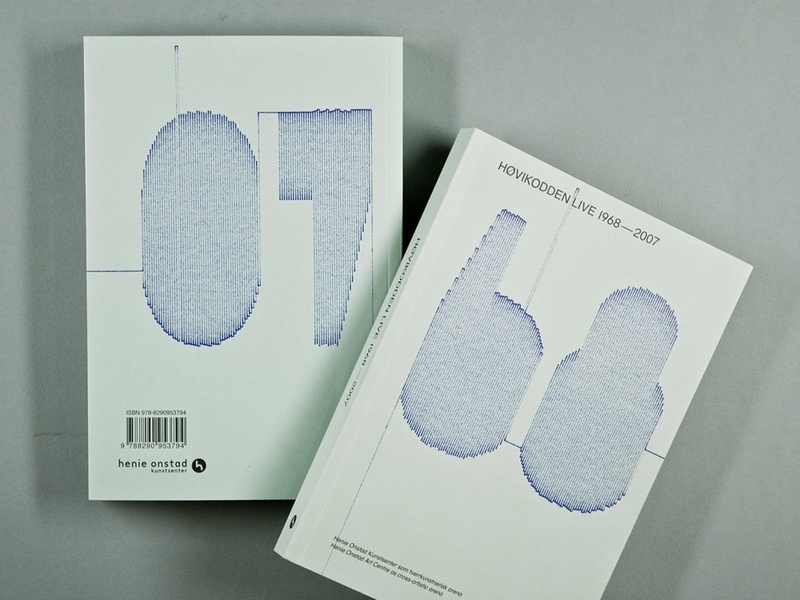 We set out to do something that reflected the performance aspect of the content, and decided to use the PenJet to write the numbers 68 to 07. We also had a PenJet running live at the opening of the event, enabling the public to witness the process. 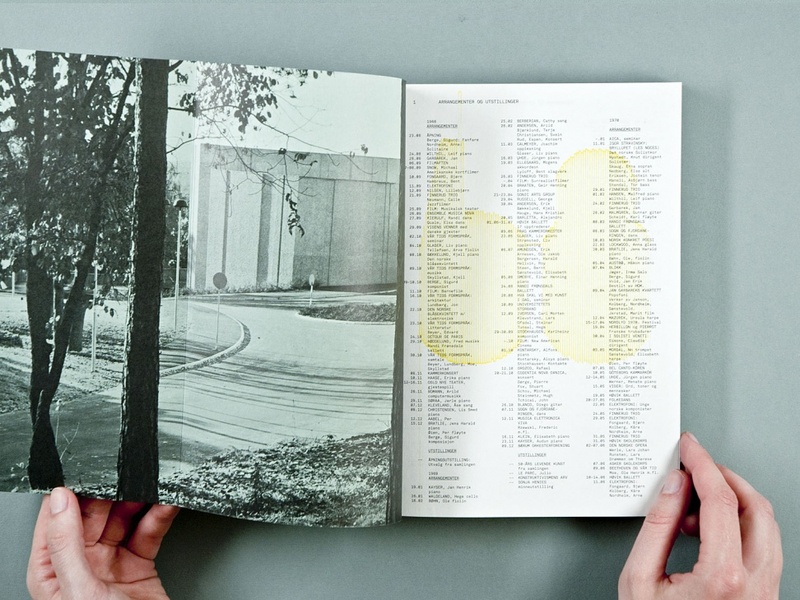 The book starts with a (nearly) complete list of all the events that have taken place at the art centre. 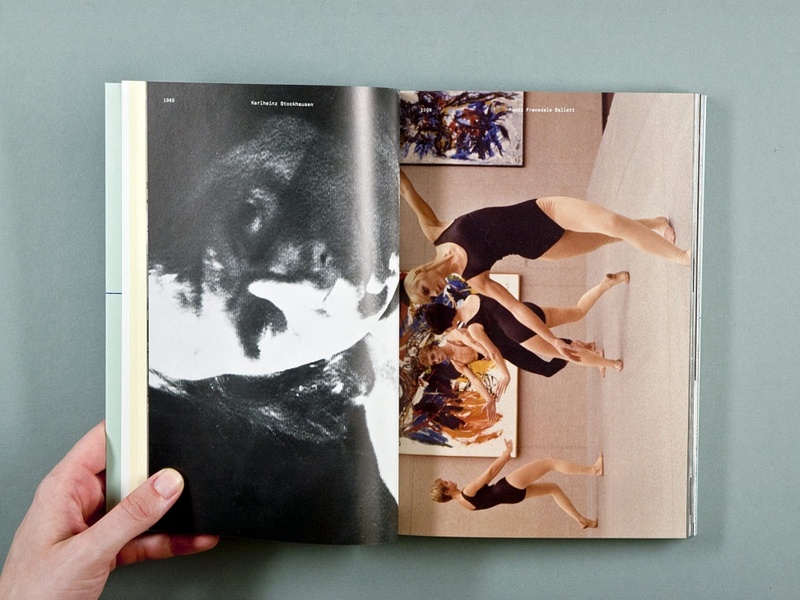 This is followed by a chronological selection of visual material from the art centre’s archive, as well as texts discussing various aspects of the art centre’s past and present. 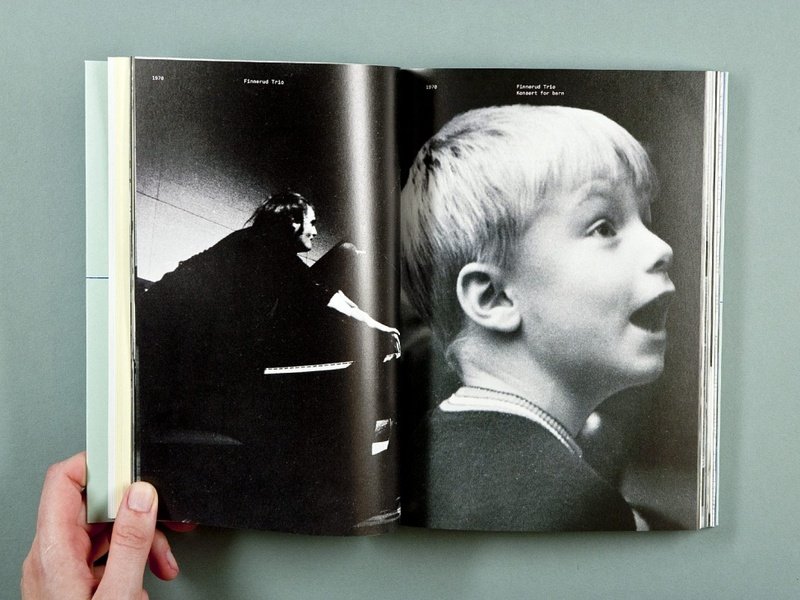 The book is bilingual, and to address the problem of having to show the same imagery twice, we decided to cut off the outer margin of the English pages, which would have contained part of the images. 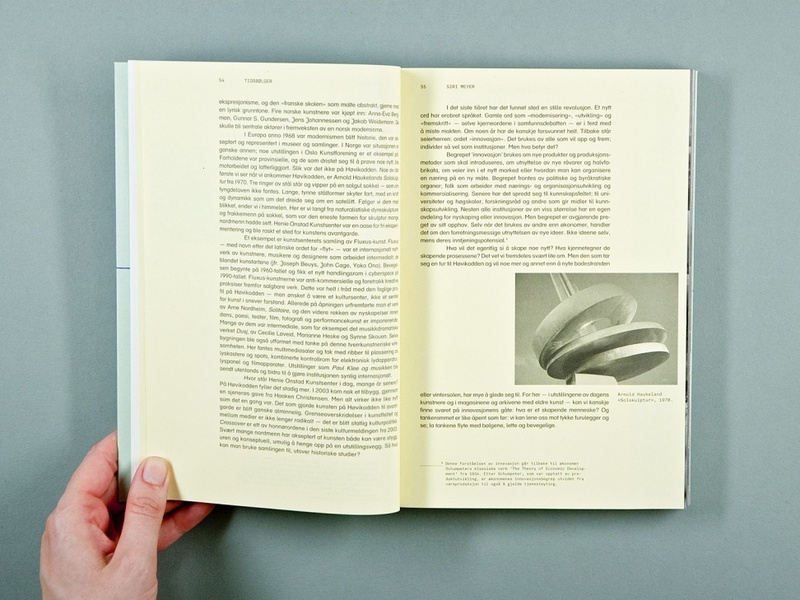 This also made it easier for the readers to browse the book. 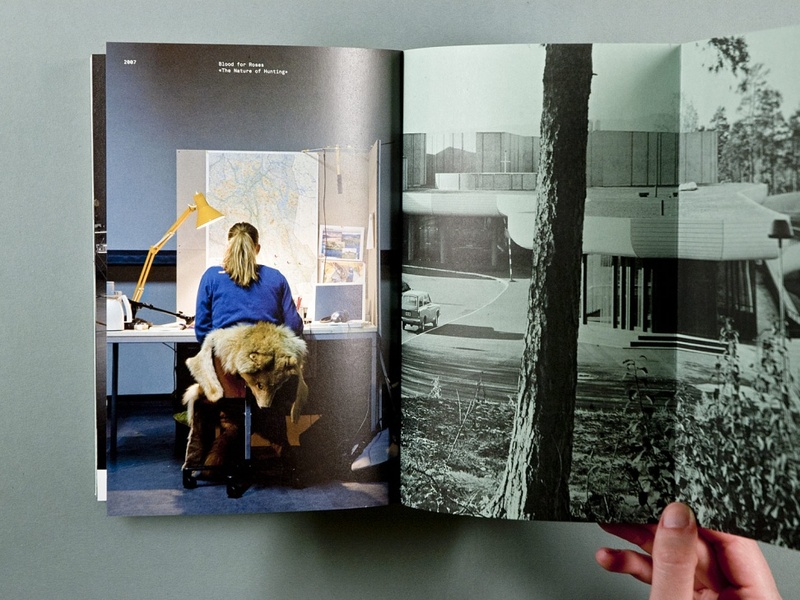 The book won the gold in the Norwegian Visuelt Prize competition.